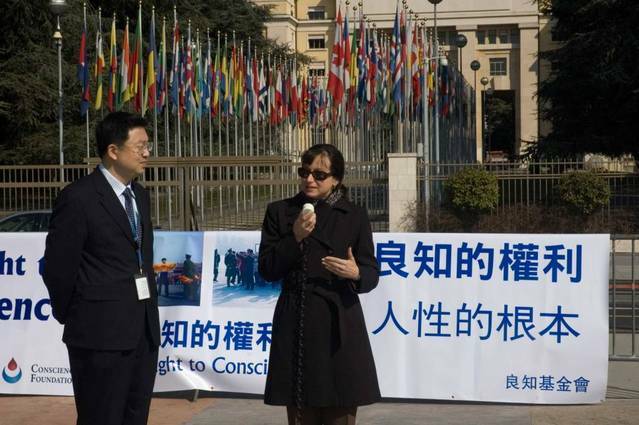 On March 17, The Conscience Foundation, Falun Gong Human Rights Working Group, and United Nations Association of San Diego held a press conference in front of the United Nations to formally release "Report on the Psychiatric Torture of Falun Gong Practitioners by the Chinese Communist Government". 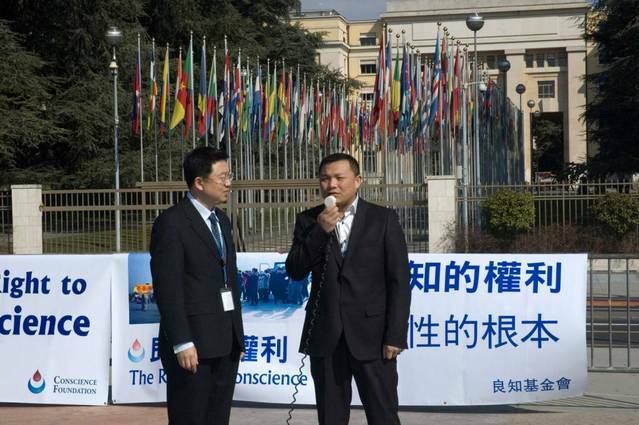 Dr. Shizhong Chen, representative of the United Nations Association of San Diego and President of The Conscience Foundation hosted the press conference. Dr. Chen said in his opening remarks that the violent persecution of Falun Gong practitioners has entered its 11th year. But at the same time, the very fact the Chinese government is continuing this persecution tells us that Falun Gong practitioners in China are persevering and still going strong. They have not given up despite the many years of persecution. Dr. Chen continued, "Failing to break the will of Falun Gong practitioners, Chinese authorities have escalated the use of nerve-damaging drugs to directly destroy their capacity of mental clarity and conscience. It amounts to the destruction of the mind. This horrifying mind-destroying medical torture has caused hundreds to become insane. The use of other harmful chemicals have also paralysed and killed many Falun Gong practitioners. It is the worst crime possible in humanity. This is because conscience, an individual's innate knowing of right and wrong, is the only thing that a human being is in control of under any circumstance. Even if the person is in jail, the person is still in control of his own conscience. Therefore, conscience defines humanity and conscience is the essence of humanity. We believe that the right to conscience is the most fundamental human right. It is the foundation on which other human rights are built upon. Therefore we believe the crime against conscience is the absolute worst crime possible against humanity. 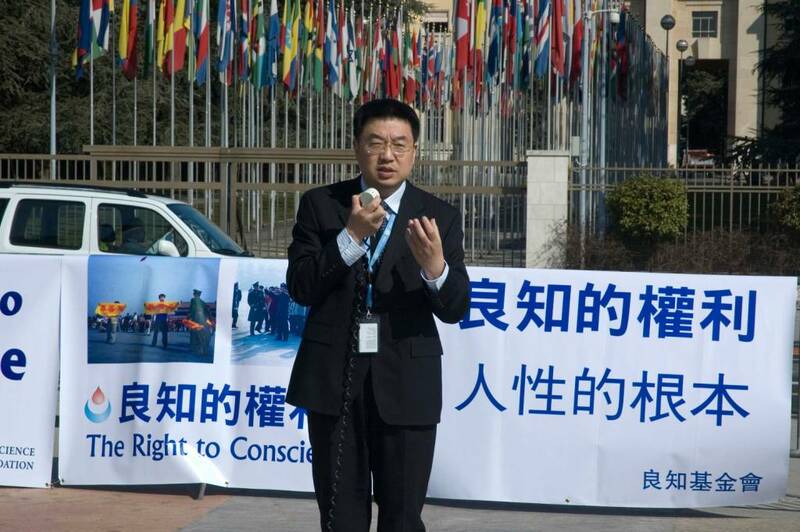 "The Chinese government not only carries out its unjust persecution of 100 million Falun Gong practitioners, but also, by using nerve-damaging drugs on Falun Gong practitioners, they actually directly destroy a person's capacity act and think according to their own conscience. Even when the Nazis killed, they killed the physical body, but in communist China, when they kill, they take away the capacity of the human being while the body is still living and breathing, but it is not a complete human being anymore. This is the crime we are here to condemn, and it is the crime we are here to ask the world to help to stop. "We have identified the doctors who used their professional skills to commit unethical acts which against what they are trained for. In fact it is against any standards of humanity. Therefore we are here to bring out this report to the world and ask the world to act together to stop such a crimes because to stay silent to mind-destroying crimes is a suicide to our collective humanity and conscience. "We ask the world to first of all to ban these doctors for knowingly participating in such a crime. Secondly in our report, we have listed over 200 hospitals that have participated in this psychiatric torture. This information is only a fraction of what we have now but it is enough to show how widespread psychiatric torture is in China. We will ask reputable journals to disallow publications from these hospitals. We must make these individuals including doctors participating in such tortures and the presidents of the hospitals to be personally accountable for what they have done. That is what we are here for." Ms. Maria Wallow of Cuba Archive speaking at the press conference. Following Dr. Chen's opening marks, Ms. Maria Wallow of Cuba Archive, an NGO that researches the persecution of Cuban people, spoke at the press conference to support human rights. Ms. Wallow said, "As you were speaking, I was thinking about several common scenes. I am here with several groups of human defenders doing activism for Cuba, but all good people know that human rights defenders stand for the sole universal rights that you are calling for in your country. It is sad that sometimes you feel hopeless. When you are at the United Nations it seems that the world does not listen to us, but you know what gives me hope is that we found each other. No matter what the doctors do to the minds of prisoners in China or in Cuba, they can not kill the human spirit and the hope we share that one day we will see our people free. That is something wonderful and that helps share our courage. There are people under the worst conditions in these countries, in China, in Myanmar, in Cuba, in North Korea that are giving that fight for conscience. They can kill one, they kill two, but they just can't kill all of them. I salute you because the right to conscience is so basic, and it is such a human thing that when you look at history, freedom does prevail, and it is an honour to share it with you." 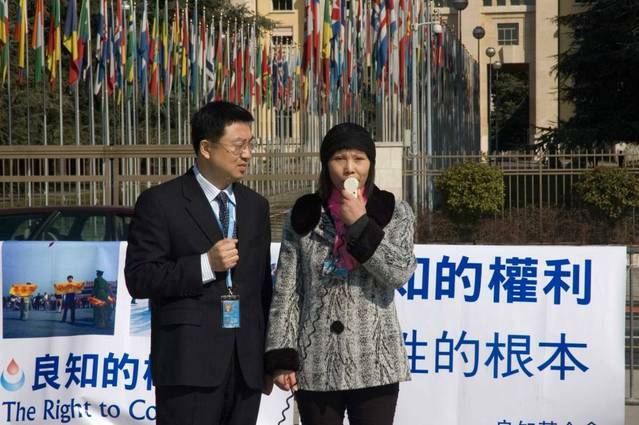 Mr. Zhang Jian is a democracy activist of China. Twenty years ago on Tiananmen Square during the 1989 student democracy movement, on the night of the student massacre, he personally tried to stop the army's slaughter, and was shot by a colonel at point blank range. Today he still has the bullet in his leg. He spoke at the press conference. Mr. Zhang said, "On behalf of overseas pro-democracy activists, today I join this event, I am very honoured to be here. "I am very glad that many people who have been persecuted can find each other at events like these. We join together to share how we understand our rights. Our rights cannot be suppressed by any dictator. "Defending human rights is difficult, it is hard work, but we are standing strong. The human rights defenders, are positive, they are motivated, because what we are defending is humanity itself. On the contrary, on the faces of the dictators, like those of Cuba, China, Myanmar, North Korea, all you can see is death. The free world may not openly speak against these dictators, but we all know that they are despised in the free world. "Although we are facing many hardships ahead of us, just as Myanmar Human Rights defender Ang-san Suji said, the very existence is our greatest victory. The dictators are afraid of us, it is not afraid of us in person, what they are afraid of is our actions, our actions to expose their crimes. "Let us join together, because the truth is on our side, we will speak up for those who have been incarcerated, who have been murdered under the dictatorship. We will work together for them. We are confident the sunbeam of freedom will shine on every corner of the world eventually." Ms. Siyi Fang, a Falun Gong practitioner from Jilin Province who escaped from China testified at the press conference about medical torture she experienced in China. Ms. Fang said in her speech, "In April of 2001, officials from the Jilin State Security Bureau, the 610 Office, and Army 465 arrested me secretly and took me to Army 465, where they tortured me constantly with drugs. Five military doctors pinned me down to a bed with my arms and legs stretched out. Then they injected my arms and feet with drugs. After the injections, I felt bloated, cold, and severe pain throughout my whole body. Immediately my left toe started to turn dark purple, and extended to the leg. I was so painful that I felt as if my throat was held so tightly that I could not breathe. I felt like I was going to have a stroke and die. "During the forced injections, because I moved my legs to refuse the injection, they pierced the needle into my flesh and rotated it. I could not stand the pain. In fact, the pain was so unbearable that I banged my head continuously and violently against the wall. On the following day they injected me with another kind of drug. After the injection, the pain alleviated but I felt dizzy, and very weak. I could not move at all. Then a dense layer of acne covered my body. I suffered severe itchiness, which lasted for about a week. When they held me down again, I cut my wrist and my hand was covered with blood. They looked at me and said coldly, "This means nothing to us. We have experienced too much like that. Even if you died, we are not afraid." As the drug took effect, I grew drowsy. They continued to give me injections until I began to have hallucinations. I was extremely weak and could not get off the bed. "After my family learned that I was arrested, the officers from the 610 Office and the doctors became worried. They were afraid that my family would see how severely I had been persecuted and get evidence of my being persecuted and expose it to the world, so they began injecting me other drugs. The purple in my legs began to fade, but the hallucinations continued and I suffered vertigo and blurred vision. I remained so weak that I could not walk." During the persecution, Ms. Fang's fiancée was beaten to death in front of her and several of her family members are still in jail. The Report of Psychiatric Torture of Falun Gong Practitioners by the Chinese Communist Government has been submitted to UN Special Rapporteur on Torture. The Conscience Foundation, Falun Gong Human Rights Working Group, and United Nations Association of San Diego are going to work with other NGOs, and medical associations and governments to ban the doctors involved in medical torture from publication in international journals and attending international conferences, and to bring these perpetrators to justice.